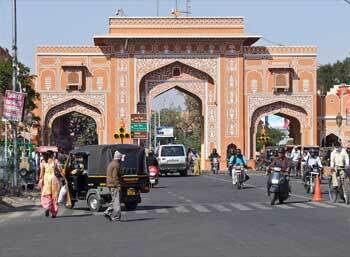 Jaipur, popularly known as the “Pink City”, and “Paris of India”, is the capital of Rajasthan state, India. Jaipur is worldwide famous for unique Architecture, Vastu, Astrology, Forts, Monuments, Palaces, Art and Craft, Culture and last but not least for unique Food. Heritage of year 1727 is still alive in Jaipur which is the main attraction of Jaipur tour. Jaipur is renowned on international tourism map as one vertex of Golden Triangle of Indian tourism. 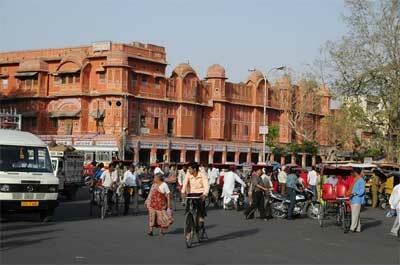 Many scripts and poems have been written on the beauty of Jaipur city by domestic tourists as well as foreign tourists. Countless documentary movies have been made on Jaipur in last 250 years. Main attractions of Jaipur tour are Amber fort, Nahargarh Fort, Jaigarh Fort, Jal Mahal, Hawa Mahal, City Palace, Galta temple, Birla temple, Govind devji temple and Albert hall museum for sight seeing. In addition to this, it is best to always check the schedules of fairs and festivals of Jaipur at the time of planning your Jaipur tour so that you can witness colorful fairs and festivals of Jaipur. 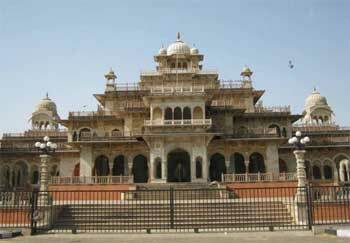 This museum building was commissioned by Sawai Ram Singh II in 1876 A.D. It is one of the finest & most beautiful examples of Indo-Saracenic style of architecture designed by Sir Samuel Swinton Jacob. The building was started as a famine relief for the craftsmen of the state. A formidable wall encircled the entire old city and there were seven gates through which one could enter the city. New Gate is the 8th gate or pol which overlooks the Ram Niwas Bagh, which was opened in the middle of the 20th century. 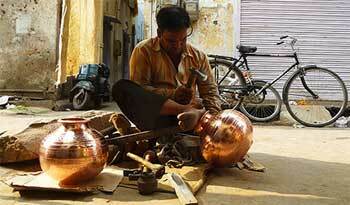 Craftsmen making brass utensils reside and work here. Traditional handtools & implements are still used by these craftsmen. A temple dating back 250 years. Several old temples with decorated features still exists in the old city. Recently renovated, it showcases the existence of continuous use of traditional materials and building skills. This community well used to be a meeting place of women folk while drawing water. But with advent of piped water supply, the relevance has been reduced. Attempts are on the restore the well & open space it to its former glory. This temple is famous for its traditional Kundan work on the walls. A very important Digamber Jain temple built in 1731. This is a dark passage connecting Sanghon Ka Rasta to Kishanpole Bazaar, over which a building exists. This building was originally built by Pandit Shivdin, the Prime Minister of Maharaja Ram Singh II, as his residence. It was converted into a school of arts in 1866. 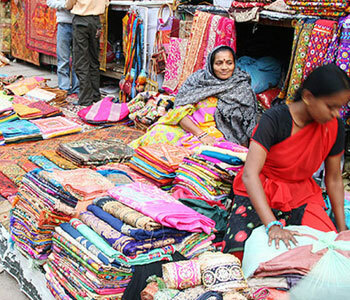 The school used to train people in all the 36 different crafts skills which were established in Jaipur. This haveli has seven open Aangans / courtyards and is a good example of traditional homes in the wall city. This is one of the largest havelis of the walled city. One of the three large public squares space created at cross section of important streets, serving as a congregational space in time of fairs & festivals. The chaupars also had community water sources, fed by canals.